If you have shopped around at almost any retailer within the past few months, you’ve probably noticed the addition of chip-enabled terminals at the register. Even though this seems like a futuristic phenomenon it’s actually an easy and safe switch that you will be happy you made! Want to know more? Below are ins and outs of chip cards to get you started on the right track! Why did New Era Bank switch to chip cards? Chip cards (or EMV cards) aren’t a specific brand or type of credit or debit card; it’s a safety standard that is already being used around the world. Your chip card will look and feel the same as your regular card, but will now have an embedded microchip inside. That microchip encrypts information anytime you pay using a chip-enabled terminal, making all of your information that much safer. Is my traditional card no longer safe? Your magnetic stripe card is still considered secure and safe; chip technology is the next level of security that will add another layer of protection to your information. You can have confidence in knowing that New Era Bank still provides protection and security for your credit and debit accounts just as we always have; chip or no chip. So, do chip cards protect me from everything? No. For every new and improved strategy to keep your information safe, comes another perpetrator finding ways to get around the advancements and continue to commit fraud. 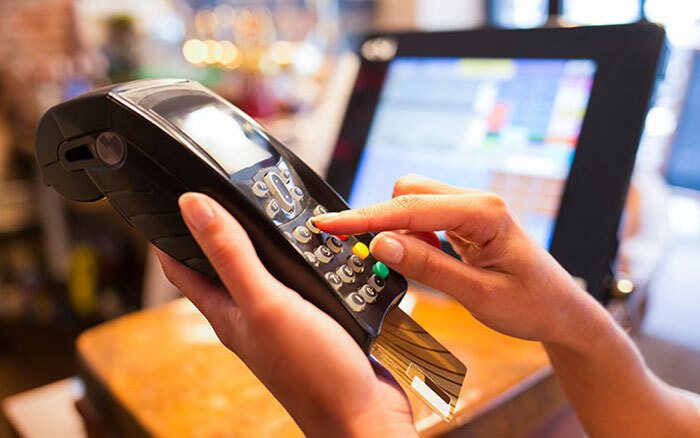 When used at a chip-enabled terminal, chip cards are like another layer security on top of the fraud prevention and protection services we already provide. How does it work, and where can I use it? If you are at a retailer with a chip-enabled terminal, you start by inserting your card face up inside the terminal. Your card will remain inside for the remainder of the payment process. From there, follow the prompts as you’re used to doing with traditional magnetic stripe cards. If a retailer does not have a chip-enabled terminal, you can still swipe your card as you usually do. No. NFC is the technology that makes it possible to make payments from smartphones and other devices without any physical contact between payments reader and payments device. Chip cards have to be inserted into the chip-enabled terminal. Do these cards track my location? No. Chip card technology does not include location tracking. The chip inside your card is limited to supporting authentication of card data when you make a payment. Are there any fees that comes with this switch? There is no additional cost to obtaining a chip card. Your account will remain the same with the exception of possible fees if you are replacing the card before it is expired. Will my chip card still work at ATMs? Yes. Your card will work at any ATM, whether they have a chip-enabled terminal, or if they only accept magnetic stripe transactions. You can still use the on-screen prompts you are used to following. What if I don't have the option of "credit" or "debit" during a transaction, or want cash back when paying with my chip card? Once your card is inserted into the terminal, you will be prompted to either enter a pin number, or provide a signature to finish the transaction. Either method will help keep your information secure, and keep anyone else from easily using your card. If entering your PIN is not available at that location, this means that cash back will not be available and you will have to use another method. Why would my chip card not work when a merchant has a chip terminal? Some merchants will have the proper chip terminal for your chip card, but won't have it turned on. If you properly insert your chip card into a terminal and nothing happens, then remove the card and swipe it like you usually would. If you have a traditional magnetic stripe card now, you won’t receive your chip card until it expires or has to be reissued. You can use your current card until then. Now you're up to date on everything EMV. If you ever have any questions regarding EMV/Chip cards, or any other aspect of your account, call your local New Era Bank and we would be happy to assist you.